For my previous blog post about ansible and my written ansible-playbook I’ve received some feedback and questions. I’ve decided to give you a short instruction how to install and configure ansible to start your own packet capture with my ansible-playbook tcpdump.yml. For this purpose I am using a fresh created t2.micro AWS EC2 Instance. The first requirement on Amazon Linux is to enable the EPEL repository. To do that I am opening the file “/etc/yum.repos.d/epel.repo” and change the parameter “enabled=0” to “enabled=1”. Having that done, I am able to install ansible and all dependencies with the command “sudo yum install ansible“. Too simple to be true. First thing to mention is that for now I don’t care about ansible roles. You can read about roles in the ansible documentation. Our first step is to open the “hosts” file in /etc/ansible/ and configure our destination servers. In the “hosts” file you can add just hostnames or IP’s or you can create a group of your choice. In this example I show you how to add groups since I am interested in starting tcpdump on all nodes in a cluster to the same time. Next step is to add / enable some parameter in the ansible.cfg configuration file. I do not go in details I will just show you my version which is working properly right now. 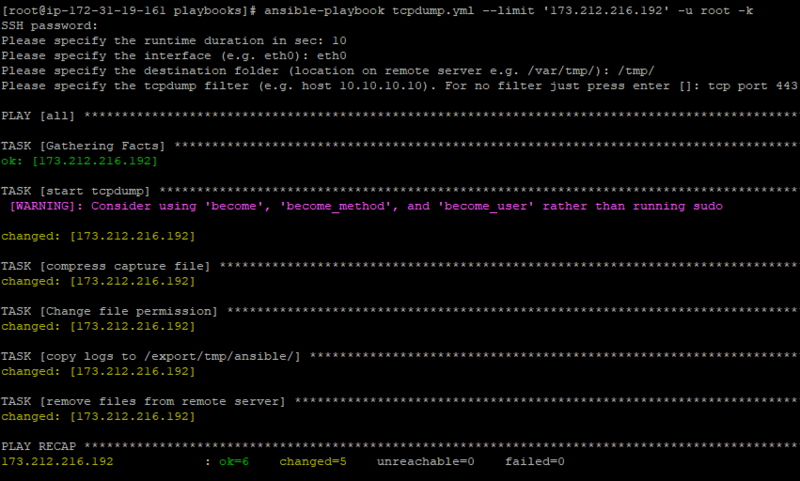 Now we are ready to run the ansible-playbook command! I am creating a new folder inside /etc/ansible/ called “playbooks”. It could be your folder with all your ansible-playbooks. I am executing git clone https://github.com/DanielSchwartz1/tcpdump and copy the tcpdump.yml file to my /etc/ansible/playbooks/ folder. With “–limit” I am specifying the group I’ve created in the hosts file. You can also do all of it with SSH keys. For this arctile I’ve decided to use the way with user+pw. The playbook takes the tcpdump, zip it, change the file permission to be able to copy it, copy the logs to your server and delete the file finally from the remote machine. I hope I was able to answer some of your questions and you feel ready to start your tcpdump with Ansible. If you have problems, don’t hesitate to contact me. If you want to know more about it, join my Slack Workspace or send me an email. Stay up-to-date and subscribe to my Newsletter! Next Post SCHWARTZDANIEL.COM – Domain Name Changed!